"The balance of all decisions, which are all of life and death, is the difference of the weight of a feather. Coffee, or wine? Go, or stay? Speak, or listen? Hesitate, or strike?" 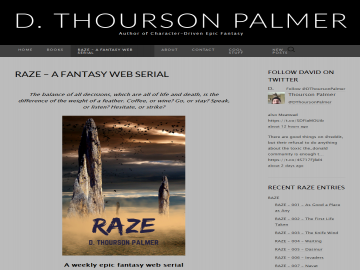 Raze is an ongoing weekly epic fantasy web serial, a serious, character driven portrait of the greatest warrior the world has ever known, told from his holding cell before his execution at the hands of the woman he loves; a cell he chose; a cell in which he waits. To find out why, you have to get to know RAZE. Raze has not been reviewed yet. Raze has not been recommended yet.